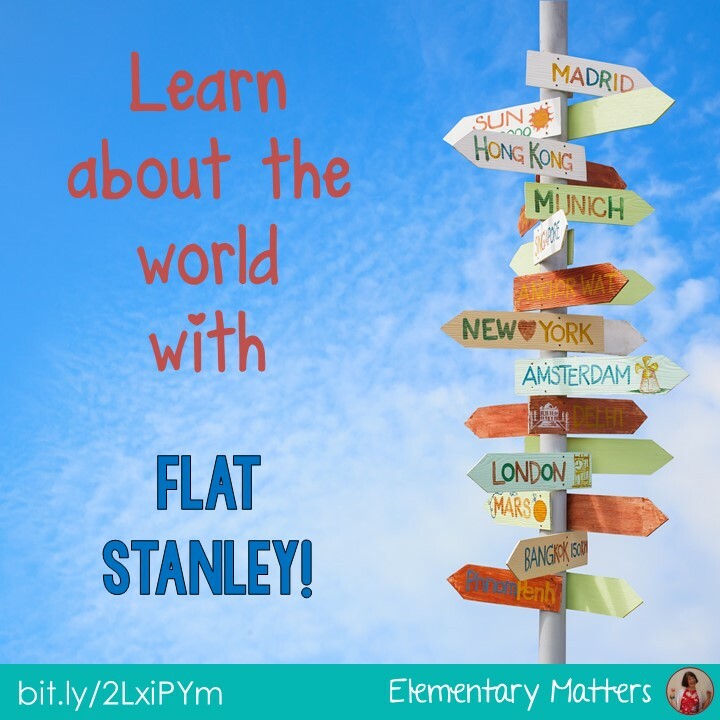 Elementary Matters: Learn About the World with Flat Stanley! My students learned about Flat Stanley this year. It's a great project. We send tagboard copies of Flat Stanley home, and the families either take Stanley someplace, or they send him to someone somewhere in the world. In case you've never heard the story, Flat Stanley had a bulletin board fall on him. He wasn't hurt at all, but ended up quite flat. Luckily for us, he was flat enough to put himself in an envelope and send himself anywhere he wants! 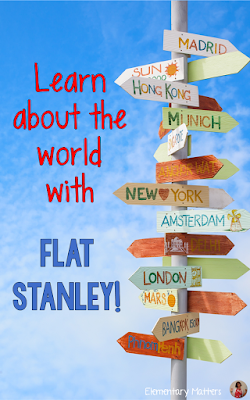 Children can make their own Flat Stanley, and send him to various places around the globe. I've seen pictures of Flat Stanley near a variety of landmarks and with a variety of famous people. In fact, I've even seen Flat Stanley with the President and on the Golden Gate bridge! So we made our Flat Stanleys and sent them out. Stanley was due back in town by June 1st, so we started sharing stories Friday during Social Studies. Being the reflective person that I am, I've been wondering how I can make the project better for next year. I started by retyping the letter I used. I added more information and attached a website with samples, ideas, and activities for kids. I made a point to mention that this was a geography project, which I neglected the first time, and led to a couple of "mystery adventures". Luckily, we solved the mysteries! I've attached the letter with blanks for you to fill in as a freebie here or click the link below. 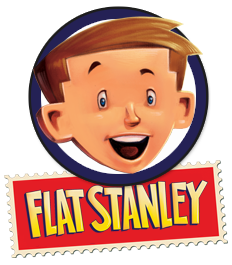 Be sure to visit this website to learn more about what you can do with Flat Stanley! You can even download your own Flat Stanley from this website! Plus, there are plenty of great photos of Flat Stanley. 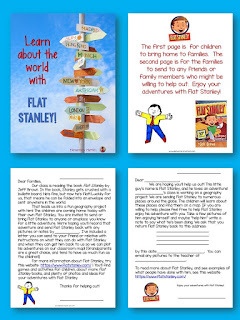 All images of Flat Stanley books on this page are links to Amazon for more information. I really never got into it, but now you have me excited to try it next year!! Enjoy! It's really cute to see all the pictures of Flat Stanley in all the clever spots! OH, we had Flat Stanley visit us from another classroom in another state. He went home with each of my Kinderkids during the year, he even was on a research vessel in Antartica! I am looping with my class this year and we are going to have a Flat Stanley picnic during July and bring our summer Flat Stanley jounals to share....love Flat Stanely! That's so cool! I'm impressed with the research vessel in Antarctica! I have been doing Flat Stanley projects for many years and it is even better every year. I have added a twist. In connection with our study of community workers - we send our "Flat students" to jobs in the community. I enlist friends and relatives to take a flat student to their job, take some pictures of the flat doing the job and tell us about the job. The kids love it! We have learned about so many interesting jobs! Sometimes I just send it to random cool jobs in the community and hope for the best. The Mayor of our city did a great job this year. What a great idea! The kids learn about helpers in the community as well as different places! It's amazing how people "play along" and have fun with it! It's a lot of fun! I'm sure your little ones will love it! My teamie does Flat Stanley every year & she has a great time with it. She has a notebook from the past 10 years of all of her students' Flat Stanley projects. I've always wanted to get involved & I'm hoping next year will be the year! Thanks for sharing! It's a fun project! I'm not sure why I never did it before this year! Thank you for sharing! I'm putting it on my wishlist for next year! There's so much fun to be had when it comes to learning! I did Flat Stanley a couple of years ago in my class. It was a huge success I sent him with all of my students families and also contacted several bussiness, companies and friends to send him to. My kids loved getting mail and emails from all of the places. I created a book and a Facebook page of all his travels (Flat Stanley CJCS) We even got some freebies from some of the places he went to visit, we even got a video from Carlsbad caverns which my kids loved!! I do Flat Stanley every year. My kiddos LOVE it and so do their parents, families, and friends. We have a world map and track all the places he goes. Thanks for sharing! I learned about this 3 years ago and decided to make a twist and send out flat families. I blogged about it yesterday and then I found your blog this morning. I really like all the different ideas mentioned in the comments. I will have to think about even more tweaking in the future. How long do you give for this project? I give them about 6 weeks. Sometimes more, sometimes less.